When compared to the likes of Europe or the northeastern United States—California’s golf history, while rich, lacks the deep timeline that golf historians get excited for. The course which stretches that timeline out the furthest towards the left is Del Monte Golf Course. In fact, Del Monte Golf Course is the longest operating golf course west of the Mississippi River. Built in 1897, Del Monte was the first golf course in California and quickly rose to prominence amongst the high society crowd who had begun to settle down along California’s central coast. 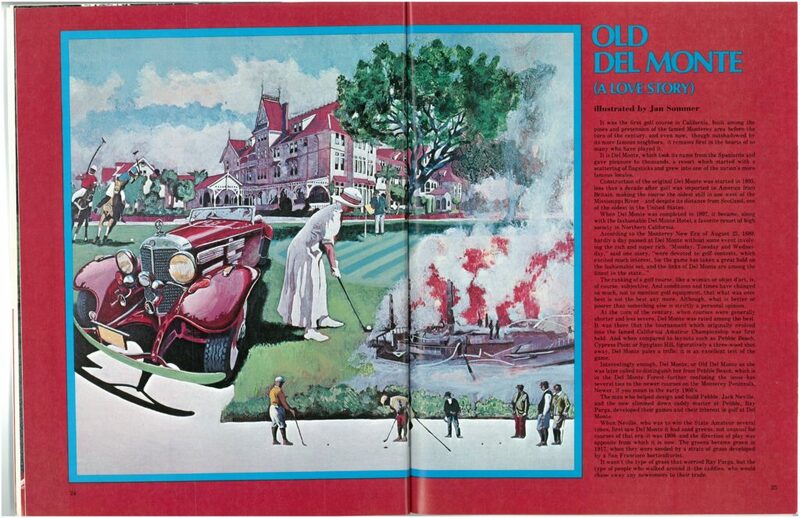 In the 1974 winter edition of NCGA GOLF Magazine, NCGA staff collected tales from the early days of California’s first high profile club. Amongst these stories came an unbelievable retelling of an incident from January of 1928 that could have been an episode of Magnum P.I. “Obviously, any course as old as Del Monte is going to have a fascinating history. There are stories involving John D. Rockefeller and Al Jolson. And one involving a guy named Charlie Brown, the late caddy master who hired [Ray] Parga and Frank Thacker, now the head pro at Spyglass Hill. Returning home from a round of golf at Del Monte in January 1928, the wife of a wealthy Chicago physician found an extortion note in her car. According to instructions, she was to leave $1,000 in unmarked bills in the sand of the tee box near the fourth tee, and, if the lady did not follow instructions or come alone, she would be shot. It sounds like a present-day story from St. Croix. The Monterey Police devised a plan right out of Mickey Spillane. An envelope was filled with paper of dollar-bill size, and good ol’ Charlie Brown, the caddy master, was dressed up in women’s clothes and, posing as the victim, walked over to the fourth tee. Police had concealed themselves in the oak trees. After burying the envelope in the sand, Brown stood up to leave, when a figure came out of the wood. Just like on television, officers stepped from their hiding places and stopped the person. It was a 17 year-old who had been working as a caddy at Del Monte. The youth claimed that an older man, ‘partly dressed like a soldier’ had promised to pay him $5 for picking up a package at the tee box. It was never proven whether the caddy was, indeed, telling the truth, and the case remained unsolved.